One of our favorite weekend things to do together as a family is eat breakfast. Sometimes we visit our local bagel shoppe; my favorite is the rye bagel with cream cheese and other times, we head to our neighborhood Dunkin Donuts. Most mornings we stay at home, in our pajamas and express our love by cooking for each other. This morning it’s an egg omelet. They really are simple to make and I like that you can customize them to fit your taste. For me, it’s cheese, mushrooms and salsa. Just Plane Dad likes cheese alone. Our tastes are pretty simple but if you’re looking for something a little grander, add-ins are the way to go. You can try spinach, cheeses, bacon, tomatoes, avocado or even fruit! Beat the eggs and milk in a bowl until blended. Heat the fry pan over medium heat. No need to use butter or cooking spray; your eggs won’t stick! Pour egg mixture into the pan. Once egg appears to be cooked (no liquid), drop your fillings onto one half of the cooked egg. Now just eat! Simple, quick and delicious. 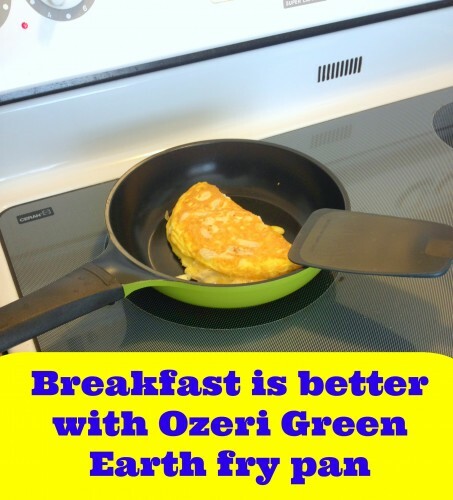 And using the Ozeri Green Earth Pan makes cooking and cleanup a snap. Its natural ceramic coating allows for non-stick perfection and is free of PTFE, PFOA and other harmful chemicals. No need to even use sprays, butter or oil. Purchase it on Amazon in three different sizes. I’m so glad they provided me one to try.